It’s Father Dave, and I’m afraid it’s going to be a short missive tonight as I’m rather tired. 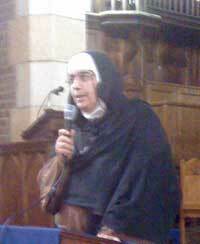 We’ve had the privilege of hosting Mother Agnes of Homs at our church! To Pete, Rob, Simone and Kayleen on their wonderful amateur boxing debuts! To Geoff (Binacrombi’s onsite manager) for quickly putting out the fire. 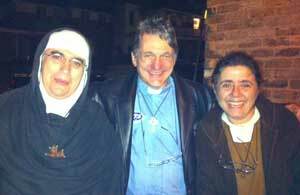 To all who participated in the visit of Mother Agnes. In truth, I only left Mother Agnes about an hour ago. She has spent the evening addressing a large group that came to hear her speak over dinner – a group that included Bishops and politicians and the press and more Syrians that I thought we had in Sydney! Yesterday’s gathering at Holy Trinity was more of a community affair. There were about a hundred of us, and probably an equal mix of Anglicans, Catholics, Muslims and others from the local area who wanted to meet this amazing nun from the other side of the world! She is an amazing woman, and she is a sweet soul, but her message has certainly been a bitter pill for many to swallow as she is calling into question the prevailing narrative about what is really going on in Syria. As someone who has been on the front-line of the so-called ‘civil war’ in Syria, Mother Agnes has been eye-witness to many terrible atrocities, and she has avoided taking sides. Even so, she challenges the depiction of the ‘rebellion’ as being something akin to Robin Hood and his merry men trying to throw off the shackles of the evil Prince. Indeed, while Mother Agnes avoided speaking directly about political scenarios, she clearly believes that a rebel victory in Syria will only result in seeing an oppressive regime replaced by an even more oppressive one. Her preference is for dialogue, and a peaceful resolution that will benefit all Syrians, and she is diametrically opposed to all foreign intervention, which she believes is inflaming the conflict and prolonging the suffering of her people. I won’t say more about Mother Agnes’ message right now as we video’d her presentation and I did a video-interview with her as well, all of which I hope to have ready for you in the next week or so. Mind you, we did attempt to do a live video-cast of Mother Agnes yesterday, and it may be that you tuned in to that? I have no idea whether the videocasts yesterday worked properly or not! Sunday morning church was rather chaotic! Everyone was late because of Daylight Savings, most of the lights and the sound system hadn’t been switched on when we started, there was no one to lead the singing, and Denning told me that the video just hadn’t kicked in! I figured my frustration and tiredness had probably permeated my preaching yesterday, so after the service I was sort of glad that the video hadn’t worked. Then Denning told me that it actually had been working the whole time and he just hadn’t realised! Thank you to Stuart who notified me immediately after the service that he hadn’t been able to pick up a thing. But thank you too to those who have subsequently told me that they caught much of the sermon and that the quality of the feed was excellent (though they said nothing about the quality of the sermon as such )! These words tend to cut rather deep for all of us who have failed in a marriage and have divorced and married again! If you did miss the video, both the audio version and the written versions of my sermon are online if you’re keen. OK. I said I’d be brief tonight but I don’t want to let you go without thanking Fighting Father Rod Walker for the forum post he made about his sister’s work at an orphanage in Mozambique. Please keep contributing to the forum, and keep commenting on the blogs. On each of these pages you’ll find an embedded video of the address along with a full transcript. I’ve also transcribed on israelandpalestine.org the details of a new law just passed in California that apparently makes it illegal to criticize the government of Israel! Your feedback would again be appreciated. OK. Enough! It’s nearly 3am and I need to get to bed! Please note that there will be NO video of the service this weekend as I’ll be taking a short holiday to attend the wedding of Geoff and Laura – two great Fighting Fathers who manage our beloved Binacrombi Bush Camp between them. I mentioned above that Geoff has an expertise in putting out fires. Evidently though there’s one still kindling between Laura and himself. I know I speak on behalf of all of our online community when I offer Geoff and Laura and their family our heartfelt congratulations and our ongoing prayers.